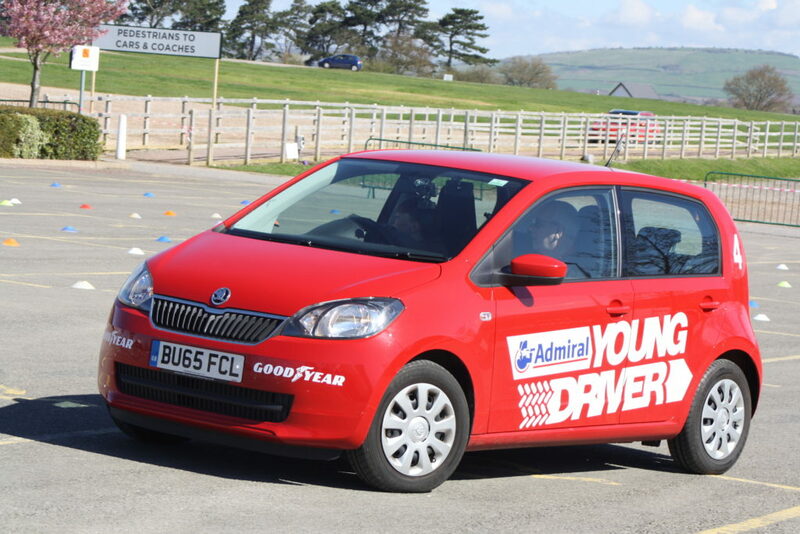 Day 108 – Sunday 17th April – my boys had a go at driving with Young Driver and absolutely loved it. It was a real highlight of the day before another miserable football match for my younger son. Day 109 – Monday 18th April – nearly nine months since my injury, I decided it was time to see if I could run further than four miles. I ran six miles and my leg felt fine. 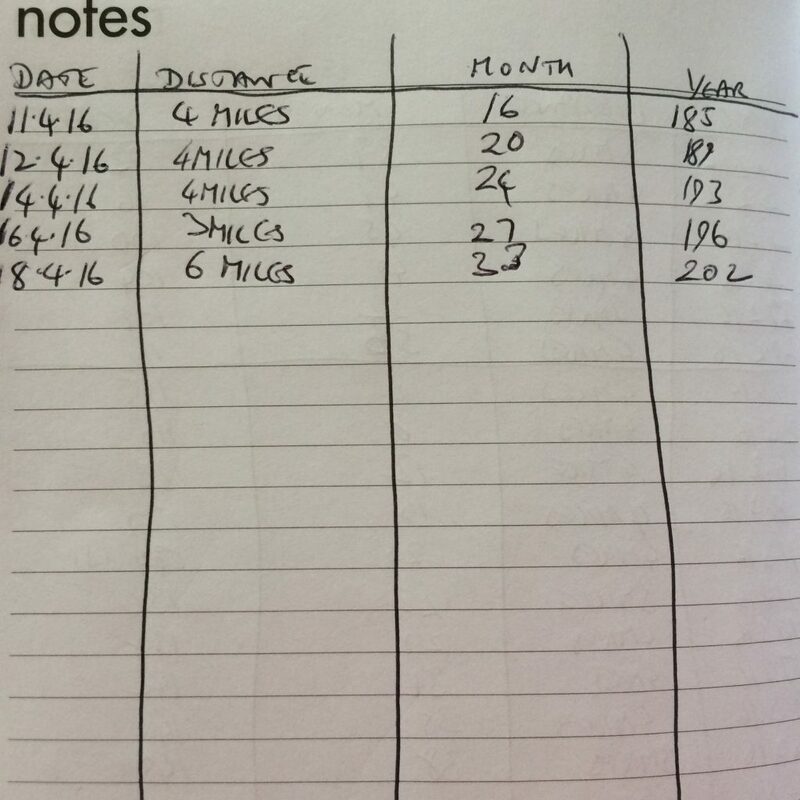 I also passed the 200 miles in a year mark. Day 110 – Tuesday 19th April – a momentous day – I walked to school without a coat! 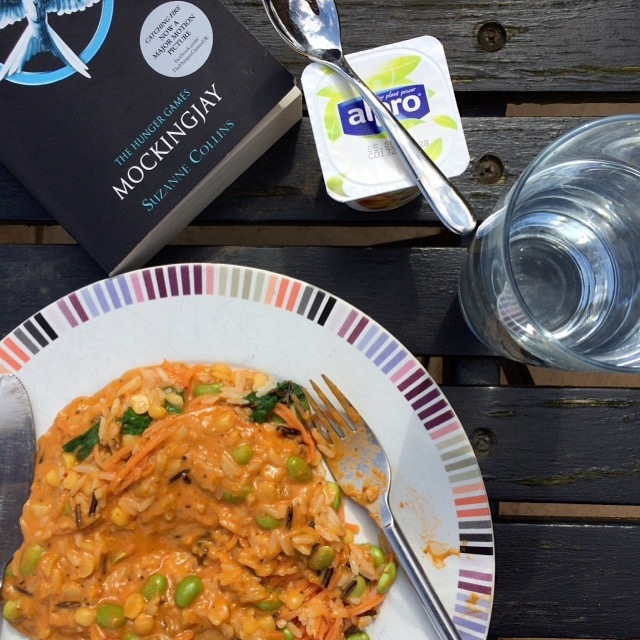 I also ate my lunch outside for the first time this year. Hopefully I will eat it outside most days until October now. 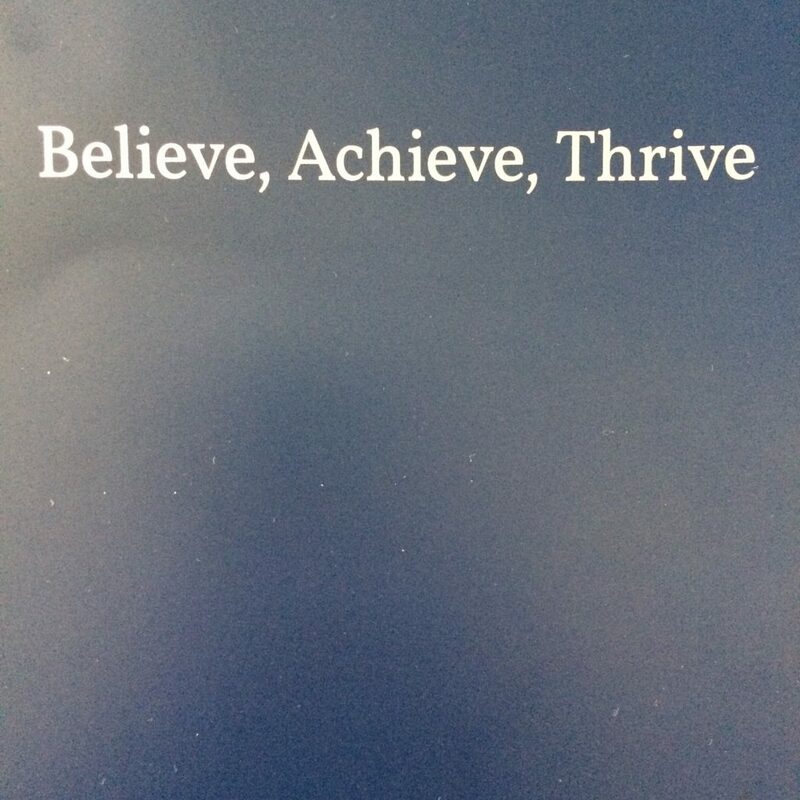 Day 111 – Wednesday 20th April – we went to see a girls’ grammar school and I’m pleased to say my daughter loved it. Now she’s just got to pass the exam! Day 112 – Thursday 21st April – I’m cheating a bit here. 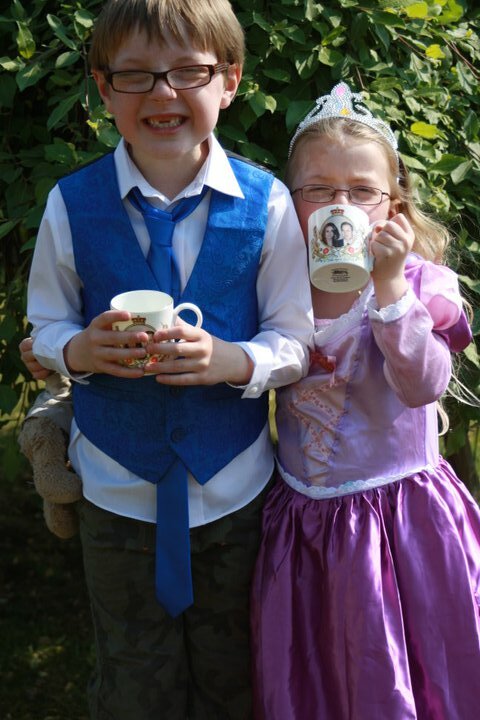 As it was the Queen’s 90th birthday, I was talking to my friend Erica on Twitter about what schools do for royal occasions and remembering prince and princess dressing up for the royal wedding. Day 113 – Friday 22nd April – I failed to take a photo today as I was so busy with a proofreading job. This is a photo of my neighbour’s blossom I took earlier in the week. Day 114 – Saturday 23rd April – Parkrun day and my husband crossed the line in front of me for the first time ever! It would be a sad day, but we both got PBs, as did my eldest. This is me ringing the bell for getting my PB. Oh wow! How exciting for your boys to be driving. I think the young driver thing is such a great idea. I have been doing the school run with just a cardi….It’s been so lovely this week. Good luck to your girl with the grammar school exam. Thanks very much! I was pleased with my PB, but slightly disappointed that my husband has finally beaten me, but I guess it was inevitable! Well done on the PB!! Even thought the OH did beat you 🙂 that’ll push you harder next time though! Your little two look soooo cute in their celebratory outfits. I want to buy the queens birthday stamps! Thanks! They did look very cute, didn’t they?! That stamp with Prince George on is so gorgeous! It is a lovely picture of your son and your daughter. The driving lesson looks really good. I think we’ll be doing that in a few years time. Thanks very much! I’d forgotten how cute they used to be. The driving is well worth trying. I’m sure my boys will do it again. love the last photo of you ringing the bell to announce your PB – and well done to all 3 of you on getting them yesterday. Thanks, I’m glad I’m not the only one who cheats with the photos! I hadn’t even realised I hadn’t taken photos for two days. Thanks very much! I bet you’re dreading the hot weather coming back, aren’t you? Thanks very much! 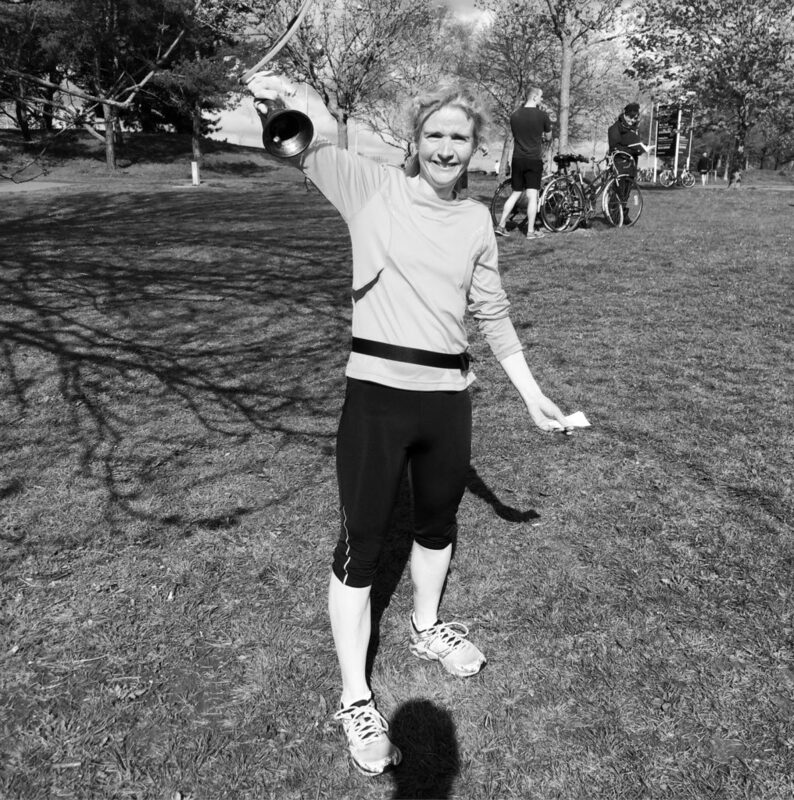 I think the PB bell is something all Parkruns have, although I may be wrong as I’ve only ever done one! You might be going backwards with running, but you’re still running further than me! Oh, great news about you’re running further without injury! I’m a bit disappointed for you about your husband beating you in park run though, this would have been devastating to me when my husband was running! Great on the personal bests for all of you, and well done to hubby, guess you will be trying hard next week to beat his time. Glad he enjoyed his young driving lesson. Hope she passes the entrance exam.